Egbert Nathaniel Dawkins III (born January 7, 1979), known as Aloe Blacc (/ˈæloʊ ˈblæk/), is a Panamanian-American musician, singer, songwriter, rapper, record producer, actor, businessman and philanthropist. He is best known for his singles "I Need a Dollar", "The Man", which topped the charts in the United Kingdom, and for writing and performing vocals on Avicii's "Wake Me Up", which topped the charts in 22 countries, including Australia and the United Kingdom. Aside from his solo career, Blacc is also a member of hip hop duo Emanon, alongside American record producer Exile. A Renaissance and Trustee Scholar at the University of Southern California, Blacc majored in linguistics and psychology and graduated in 2001. He worked briefly in the corporate sector for Ernst & Young. In 1995, Blacc teamed with hip hop producer Exile and formed Emanon -- 'no name' backwards—which was inspired by the title of a Dizzy Gillespie song. With break-beat loops and jazz samples, Emanon became a mainstay of the indie rap underground, and released their first mixtape in 1996, followed by the EP Acid 9 in 1999. They subsequently released six projects, the demo album Imaginary Friends (1996), a compilation Steps Through Time (2001) the albums The Waiting Room (2005) and Dystopia (2016) and EPs Acid 9 (1998) and Anon & On (2002) respectively. A fourth album, Bird's Eye View, was recorded but shelved, it is unknown if the material was reworked into their 2016 reunion album Dystopia. While Emanon was Blacc's primary project during this time period, he additionally toured and recorded with the members of the collective Lootpack and worked with the French jazz group Jazz Liberatorz. Blacc launched his career as a solo artist in 2003, releasing two EPs, and signing to Stone's Throw Records in 2006, after label head Chris Manak (known as Peanut Butter Wolf) heard Blacc and immediately offered him a contract for the 2006 full-length Shine Through. By then, he had become more focused on songwriting, a change inspired in part by his social consciousness. "I was uncomfortable with the state of hip hop being largely about the expression of ego. I wondered how I could be more crafty at writing songs in the form of a rap that actually expressed more than ego, style and finesse," he stated. "I figured I would educate myself to learn more about songwriting and apply that later to hip hop." Shine Through was Blacc's first full-length album and was released in 2006. It received significant media attention in the U.S. and abroad. Pitchfork wrote that Shine Through had "flashes of keen musical interpolation" and signaled "some sort of greatness", NPR named the track "Nascimento" as song of the day, and Absolute Punk noted that Shine Through flows beautifully from one track to the next, infusing old-school funk and soul with a modern essence that makes it incredibly unique  Also in 2009, while working on his second album, Blacc toured Europe and the United States with Emanon, and collaborated with the Japanese hip hop producer Cradle on a project called Bee. Aloe Blacc with Randal Fisher (saxophone); Chris Bautista (trumpet) live at the NSJ Festival, Rotterdam, Sunday 08 July 2012. In 2010, Blacc released Good Things on Stones Throw Records. A commercial success, Good Things was certified gold in the UK, France, Germany and Australia, among other countries, and ultimately hit double platinum sales. The single "I Need A Dollar", which was used as the theme song to the HBO series How To Make It in America, reached 1 million in sales in 2013; two additional singles, "Loving You Is Killing Me" and "Green Lights" became European hits as well. Good Things was praised by the media, receiving positive reviews in the Los Angeles Times, The New York Times, Spin, NME, and Entertainment Weekly, among others. Shortly after the release of the record, Blacc signed with Simon Fuller's XIX Management. Aloe Blacc, was introduced to Swedish DJ Avicii by Linkin Park's co-vocalist Mike Shinoda who was a good friend of Avicii. As a result, in 2013, Blacc co-wrote the song "Wake Me Up" with Avicii. With Blacc on vocals, the song reached #1 in 103 countries and became the fastest selling single in the UK, selling 267,000 copies in its first week. He also collaborated with Avicii on a track called "Liar Liar" that featured Blondfire as well. In September of that year, Blacc signed with Interscope Records and released an EP, titled Wake Me Up EP. The five-track EP included the songs "Love is the Answer", "Can You Do This", and "Ticking Bomb", as well as an acoustic version of "Wake Me Up". "Ticking Bomb" was used as the background music for the new Battlefield 4 game TV advert, and "The Man" as background music for the Beats by Dr. Dre commercials featuring Kevin Garnett, Colin Kaepernick, Richard Sherman and Cesc Fàbregas. "Ticking Bomb" is also the theme for the WWE Pay-Per-View Payback. In October 2013, Blacc released the music video for the track "Wake Me Up". Blacc collaborated with the immigrant rights group National Day Laborer Organizing Network and the ABC* Foundation's Healing Power of Music Initiative. The director was Alex Rivera. The cast were real life immigrant activists: Hareth Andrade Ayala (a Virginia leader in the immigrant youth movement working to stop her own father's deportation), Agustin Chiprez Alvarez (a Los Angeles day laborer), and Margarita Reyes who was deported with her mother as a child despite being born in the U.S.
Aloe Blacc is married to Mexican-Australian rapper Maya Jupiter. In 2013, they had their first child, a daughter. 2016 - Sesame Street Sings "Everyday Hero"
^ a b Doyle, Patrick. "How Avicii Helped Aloe Blacc Wake Up and Break Out". August 28, 2013. Rolling Stone. Retrieved October 22, 2013. ^ Lancaster, Elizabeth. "Avicii Describes His 'Straight-Away' Attraction To 'Wake Me Up'". September 5, 2013. MTV. Retrieved October 23, 2013. ^ "Aloe Blacc Teams with NDLON, abc* Foundation for Acoustic Video of No. 1 "Wake Me Up"". October 24, 2013. Reuter's. October 23, 2013. Retrieved October 24, 2013. ^ Complex Mag. "Interview: Aloe Blacc Talks New Album, Touring, and His Rap Past". August 20, 2012. Complex. Retrieved 26 October 2013. ^ a b Bose, Lillideshan. "Retro Soul Singer and OC Local Aloe Blacc Talks About his Socio-Political Fetish". September 28, 2010. OC Weekly. Archived from the original on October 29, 2013. Retrieved October 24, 2013. ^ a b c Vasquez, Andre. "Underground Report: Aloe Blacc & Exile". September 17, 2010. Hip Hop DX. Retrieved October 24, 2013. ^ Weiss, Jeff (November 14, 2010). "Rappers Flow Towards Singing". November 14, 2010. Los Angeles TImes. Retrieved October 28, 2013. ^ a b Weiss, Jeff (November 14, 2010). "Rapper Flows Toward Singing". November 14, 2010. Los Angeles Times. Retrieved 24 October 2013. ^ "Emanon - Acid 9". Discogs. Retrieved October 24, 2013. ^ Fennessey, Sean. "Aloe Blacc: Shine Through". December 15, 2006. Pitchfork. Retrieved 24 October 2013. ^ Murph, John. "Blissful Optimism Fades into Doubt". July 10, 2006. NPR/Song of the Day. Retrieved October 22, 2013. ^ Walker, Ian. "Aloe Blacc - Good Things". October 9, 2010. Absolute Punk. ^ "Red Bull Music Academy". www.redbullmusicacademy.com. Archived from the original on April 22, 2016. Retrieved 2016-04-28. ^ a b Vozick-Levinson, Simon. "Aloe Blacc's 'I Need a Dollar' (the awesome 'How to Make It in America' theme song) gets a music video". April 5, 2010. Entertainment Weekly. Retrieved 26 October 2013. ^ "Archival Charts (Soundscan)". 2013. Neilson Soundscan (by subscription only). Retrieved 26 October 2013. ^ Parkin, Chris. "Album Review: Aloe Blacc - Good Thing". September 24, 2010. NME. Retrieved October 23, 2013. ^ Kennedy, Adam. "Aloe Blacc Good Things Review". September 27, 2010. BBC. Retrieved October 23, 2013. ^ Reeves, Mosi. "Aloe Blacc Good Things". September 9, 2010. Spin. Retrieved 23 October 2013. ^ Martens, Todd (December 2, 2010). "72 Hours: Os Mutantes, Aloe Blacc and the Wu-Tang Clan top this weekend's shows". December 2, 2010. Los Angeles Times. Retrieved October 23, 2013. ^ CMU Staff. "Fuller company forms label with Sony". November 24, 2011. CMU. Retrieved October 26, 2013. ^ Renshaw, David. "Avicii's mix of EDM and country has given ravers a wake-up call". October 24, 2013. The Guardian. Retrieved 24 October 2013. ^ Kawashima, Dale. "Interview with John Ehmann, Senior Director of A&R at Interscope Records". 2013. Songwriter Universe. Retrieved 26 October 2013. ^ Lewis, Brittany. "Aloe Blacc Releases Pharrell-Produced New Single". September 25, 2013. Global Grind. Retrieved October 26, 2013. ^ Le, Van. "MUST-WATCH: "WAKE ME UP", FEATURING ALOE BLACC AND DREAMER HARETH ANDRADE". October 23, 2013. America's Voice. Retrieved October 26, 2013. ^ "Aloe Blacc Teams with NDLON, abc* Foundation for Acoustic Video of No. 1 "Wake Me Up"". October 23, 2013. Herald Online (Via Interscope). Archived from the original on October 29, 2013. Retrieved October 24, 2013. ^ Sciaretto, Amy. "Aloe Blacc to Release "Lift Your Spirit" in Early 2014". August 20, 2013. ARTISTdirect. Retrieved October 26, 2013. ^ "Episode 4, Series 44, Later... with Jools Holland - BBC Two". BBC. Retrieved 2018-06-12. ^ "Aloe Blacc releases world cup anthem", mtv.co.uk; accessed September 26, 2014. ^ The Voice [@NBCTheVoice] (11 February 2014). "Drumroll please...@adamlevine's Season 6 advisor is the talented @aloeblacc! RT to welcome him to #TheVoice fam" (Tweet) – via Twitter. ^ "ESPN Music on Twitter". Twitter. Retrieved July 14, 2018. ^ "Tiesto Chases Big, Wide Skies on 'Carry You Home' With Aloe Blacc, Stargate: Listen". Billboard. ^ "Watch Nick Jonas, Wiz Khalifa & More Guests Surprise EDC Las Vegas 2018". Billboard. ^ "Mission Statement". 2013. Malaria No More. Retrieved 23 October 2013. ^ Blacc, Aloe (April 19, 2012). "My Journey Of Discovery In Ghana With Malaria No More UK". April 19, 2012. Huffington Post. Retrieved October 22, 2013. ^ "Who is Aloe Blacc? You already know him". Chicago Now. Retrieved September 26, 2014. ^ a b "2012 Brit Awards". 2013. Brit Awards. Archived from the original on October 29, 2013. Retrieved October 24, 2013. ^ "Centric Award|Soul Train". 2011. BET. Retrieved 24 October 2013. ^ Closs, Wyatt (November 28, 2011). "2011 Workers Voice Awards Named, Signals Strong Year for Worker-Based Themes in Pop Culture". November 28, 2011. Huffington Post. Retrieved October 22, 2013. ^ "'American Idol' Recap: Starry Duets and Swift Exits". Variety. ^ "'Blackish' gives a powerful history lesson — with nods to 'Hamilton' and 'Schoolhouse Rock'". Washington Post. ^ "Who covers Beatles songs in Netflix's new series Beat Bugs?". Radio Times. ^ "Ben Rector, Sarah McLachlan, Aloe Blacc to Perform in This Year's Macy's Thanksgiving Day Parade". ABC News Radio. ^ "Aloe Blacc Appears on DIRECTV's Guitar Center Sessions Tonight". Broadway World. ^ "Bill Nye, Rob Reiner visit Bill Maher". LA Times. Retrieved Feb 17, 2015. ^ "Aloe Blacc is definitely 'The Man' on the TODAY plaza". Today. ^ "Aloe Blacc on the Tonight Show starring Jimmy Fallon". NBC. Retrieved October 4, 2018. ^ "The Queen Latifah Show". TV Guide. Retrieved October 4, 2018. ^ "Aloe Blacc Wins Me Over At the Gucci Brunch". Yahoo. ^ "Billy Bob Thornton, Hannibal Buress, music from Aloe Blacc". ABC. ^ "Kids' Choice Awards Sets First Performers and Presenters (Exclusive)". The Hollywood Reporter. Retrieved March 12, 2014. ^ "Aloe Blacc Performs "Can You Do This" Live On Ellen". Okay Player. ^ "'The Voice' Recap: Contestants Battle On As Aloe Blacc, Jill Scott, Miranda Lambert Join as Mentors". Billboard. ^ "Adam Rippon Tears Up the Dancefloor to Aloe Blacc's 'Make Way' on 'DWTS'". Billboard. 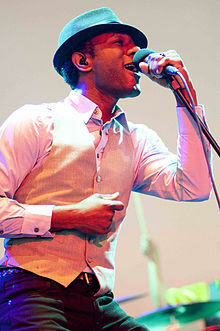 Wikimedia Commons has media related to Aloe Blacc.